The gist is that some parents have raised the bar on gifts for teachers to an extent at which parents are feeling bullied into donating sums of money – around £5 to 10 – to buy a spectacular present for the class teacher. No matter Mr Windarse has not been the most effective teacher for little Hermione, the expectation is that a present costing around £150 is perfectly acceptable. This brought me up short. I have never taught with an eye on the presents that some students offer at the end of term and I would be horrified if my colleagues were leaving copies of catalogues open on tables or working the terms “Chateau Lafitte” into writing tasks to encourage the little darlings. This is all wrong. We don’t teach for the money (natch) and we don’t teach because there may be an exciting gift at the end of the process. I teach because i love it. I use all my energy and stamina during the academic year to engage with and to assist little Hermione in developing her skills and her awareness of her own abilities and her worth. It is a job that is utterly rewarding on its own terms. The article made me think, however. I was leaving my school this year after 10 years and have been humbled and amazed at the moments of gratitude I have received. Not presents, but students I have taught stopping me in the corridor or emailing me or tweeting me to say “thank you”. Actually, I am amazed. I did not realise what an impact a balding, stoutish middle aged man could have. But this is the point. I don’t need huge presents. The look in the eyes of one delightful y12 girl who has not always made the right choices but who bursts with energy and latent ability is enough. The small child who gave me a carefully wrapped bar of chocolate said so much more than a parent consortium ever could. 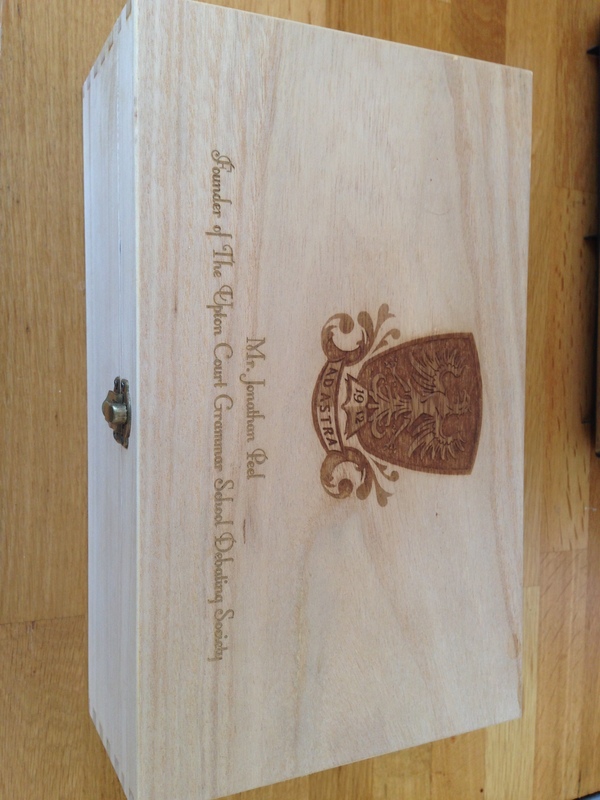 And then there was the small wooden box. This morning at 9.10 my feeling of humility and awareness of what an incredible profession we are in rose to a new level. I have seen nothing like this in ten years (and that includes the 12 Days of Christmas T-shirt from the first VIP). The Debating team arrived in my form room for a “photo”. They carried a small package which was passed over with some ceremony. I was a little apprehensive asI opened it in front of 20 pairs of eyes – we have all received “that” tie and been lost for words, I am sure- and unwrapped the plain paper to reveal a small wooden box. On the top was engraved the school crest and a dedication to me. 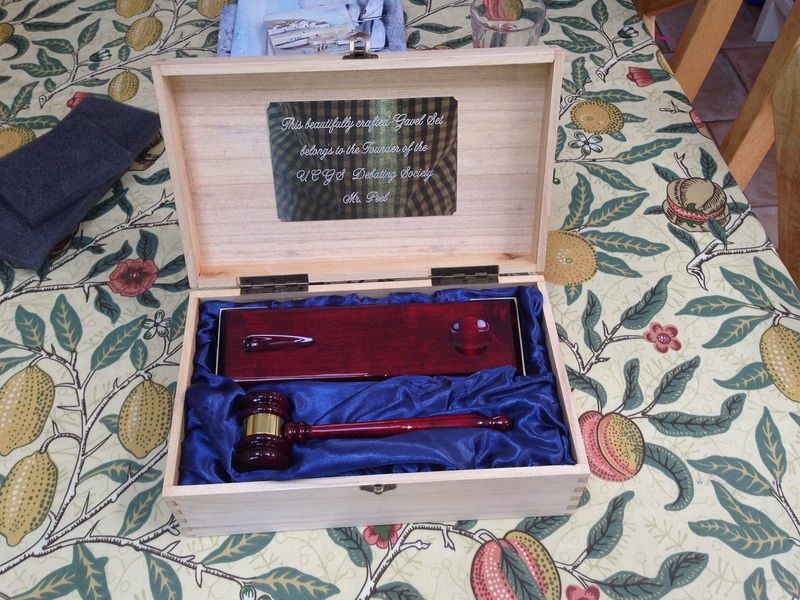 Inside a further silver plaque which informed me that I was the owner of this “gavel set”. Under the padding a lovely gavel and rest. It seems that they had noticed that I often knock when timekeeping with my shoe or any other instrument that falls to hand. The whole thing had been designed and made by the students (long live RMT) and showed such obvious affection that I knew not what to do. How do you say thank you for a gift which is so clearly heartfelt and which shows such awareness of the hours that we put in to give the best opportunities to our children? I am humbled and honoured to receive this gift. So, parents, if you really exist, compete by all means and buy teacher an i-pad or whatever you wish. Or, leave it to your wonderful children to touch their teachers’ hearts by not giving for the sake of it, but because we have touched them in some way. This is the reality of the situation. I do my job and I do not need a gift for doing so. When one arrives like this, however, it is enough to make me want to go on teaching for ever. Devi, Ridds, Samraj, MAK, Zainab, Callum. You were a brilliant group who made me so proud, so often! Moving on: thoughts as I leave for pastures new. Wonderful article, and a beautiful gift. Jon, you do take after your Mum and Dad as a teacher who inspires,and engages students and in the process makes lives richer. Great article and what a thoughtful and observant present, although I’m sure the sight of your size 14 shoes being used as a gavel will be much missed.